Buddy Deppenschmidt: The Man Who Drummed the Brazilian Beat into American Ears! Never print anything in haste – or in anger – I always say. Well, maybe the time finally came for me to get a taste of my own critical medicine. But first, a little background info. Back in August 2004, I published an online article called “Damn the Drummer, Where’s the Composer?” It concerned my response to a piece I had read in the June 2004 issue of Jazz Times about drummer Buddy Deppenschmidt’s claim that he was the person who came up with the idea of bringing bossa nova to the United States. What was his method for having accomplished this incredible feat? According to Buddy, it was via the classic album Jazz Samba, which featured him and bassist Keter Betts, along with two giants of the genre: saxophonist Stan Getz and guitarist Charlie Byrd. 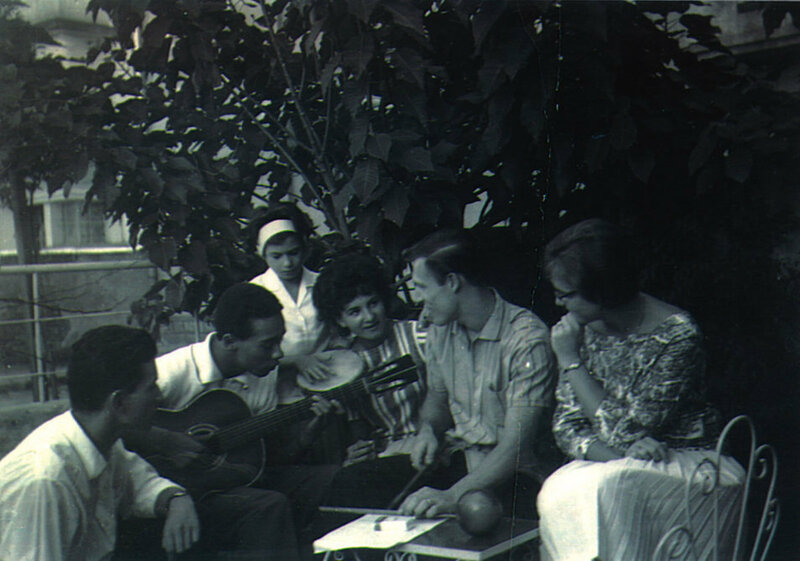 Buddy’s idea of recording an album of freshly minted bossa-nova tunes, which at the time his 1960 State Department-sponsored trip to Brazil took place was an all-but unheard-of genre in North America, turned out to have been a godsend. If anything, it changed the course of both jazz and popular music for all time. As a native-born Brazilian and lover of the country’s music, my initial reaction to this article was to be “offended” and “put-off” by the sheer brashness of Buddy’s claim. As far as I was concerned there has never been as much recognition for Brazil’s contribution in giving birth to this new style of play as there had been for the American musicians who played it – i.e., Getz, Byrd, Bud Shank, Herbie Mann, Dizzy Gillespie and their ilk. In my mind, credit was “long overdue” to the groundbreaking Brazilian personalities who started it all, and not to “long retired” jazz artists and their alleged “claims,” as I indicated in my rebuttal piece. To say that I was dead wrong about all this is putting it mildly. Last year, I had the surprise of my life when none other than the “damn” drummer himself, Mr. William “Buddy” Deppenschmidt Jr., wrote me a long-delayed e-mail. Not only was Buddy still around, but he was very much alive and well and living in Bucks County, Pennsylvania. Here’s a sample of what he wrote: “I am not a ‘long retired’ Jazz musician, as you surmise in your August 2004 article in Brazzil Magazine, but lead a busy professional life, performing and teaching. That is why it has taken me a while to find the time to respond to your article… (And the same reason it took me so long to bring my story to light.) I understand why you are proud of your heritage and want to see credit given to great Brazilian composers and musicians. At age 76, Buddy is (thank goodness) still playing and still going strong. And, as can be seen by his thoroughly insightful commentary, his recollection of the events of his now-historic trip to Brazil is unimpaired and as clear to him as if it happened yesterday. Buddy went on to write: “The 2004 magazine article, ‘Give the Drummer Some,’ in Jazz Times, is accurate, including all that I stated regarding Stan Getz. [Author] David Adler did a fantastic job of putting the article together and digging up the truth, while trying to be fair to all; so I am sad to see that his and my intentions were at all misunderstood. I wanted the real story, not the fable of the various album liner notes, to be told at last. “I take credit for my part in the venture as related by Mr. Adler, and no more. Someone else made the remark that I ‘practically invented Bossa Nova.’ I didn’t say that and never would. I considered myself a musical messenger and knew that my message was important, so I still kept driving at it even when they tried, unsuccessfully, to do the album without Keter and me. “Jazz Samba,” he insisted, “was intended to be an homage to Bossa Nova, which as you know, was little known outside of Brazil in 1961. In fact, the original Odeon recordings of João Gilberto were released here earlier, on the Pacific Jazz label, but went quietly out of print, which is astonishing. When I learned the music and rhythms in Porto Alegre (and I never called it a “master class”)  I just wanted to present this music that I love to the American audience; I did not foresee that it would be such a commercial hit. I was busy playing and supporting a family and was therefore unaware of its phenomenal success until much later. I never did reap much financial reward from it and certainly no royalties. Somehow the record company could not come up with any sales figures because it’s so ‘old.’ Nonetheless, you can buy Jazz Samba today at any Barnes & Noble for about twenty bucks. “I suppose it could be considered an early fusion album,” continued Buddy, “combining American Jazz with the new Brazilian music. It was a heartfelt tribute. The audiences in South America really appreciated our music, so this was an appropriate blend. The success of this record enabled many deserving Brazilian musicians to come to the U. S. and showcase their talents. By the way, the woman you referred to as the ‘mysterious woman’ is Malu Pederneiras, a most generous and hospitable person who cares about other people, even gringos. She has known João Gilberto since childhood. Malu came to visit us here last October 2010. 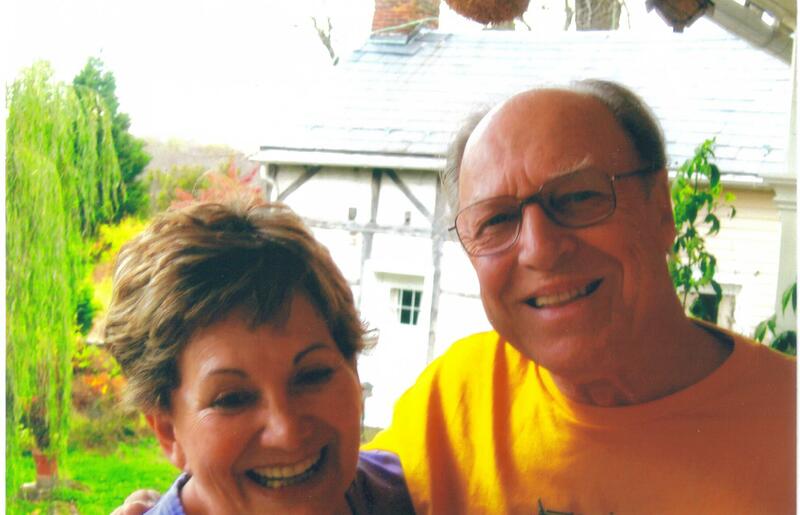 We hadn’t seen each other in 50 years – since the State Department tour. It was a wonderful reunion that meant so much to both of us. After that testimonial, what was there left for me to say? Buddy was absolutely correct in his assessment that such major artists as João Gilberto, Tom Jobim, Sergio Mendes, Oscar Castro Neves, Astrud Gilberto, Bola Sete and countless of their countrymen would never have been heard here had it not been for bossa nova opening the country’s doors to them. Buddy was kind enough to leave me his home telephone number and asked that I get in touch with him, which I did. He even snail-mailed me his four-page press release, which outlined his case in detail. Consequently, we had a long and thoroughly enlightening conversation (and several more after that) that we began – and ended – as fast friends. My intention in posting this piece on my blog today is not just to set the record straight “going forward” regarding the issue, but to publicize it in a manner that was unavailable to Buddy back in 1961. 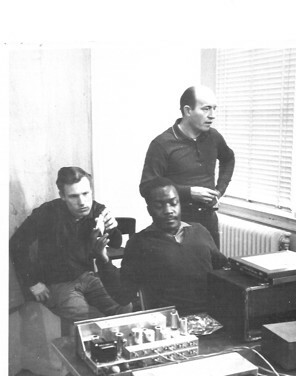 I do not know if Buddy’s claims and subsequent lawsuit has ever borne fruit; and, as indicated in the original piece, author Adler stated that practically all of the participants involved in the landmark Jazz Samba recording have long since passed on. We may never know the whole truth behind the revolutionary concept, but I am convinced, by reading Buddy’s letter and press release, listening to his recordings, and speaking to him at length about the matter, that he knows perfectly well what he is talking about; that he absolutely loves Brazilian music; that he both knows and loves Brazil and its people; and that, if he was not the sole individual responsible for bringing bossa nova to the public’s attention, then he came awfully close to doing so! With that in mind, I took much delight in asking the publishers of the original Website to take down my article, “Damn the Drummer, Where’s the Composer?” and permanently remove it from its online content. I did this of my own free will and in the spirit and recognition of Buddy Deppenschmidt’s unquestioned place in music history, as a true and bona fide American jazz artist, as well as a respected teacher and role model in his community. In fairness to my original piece, here is what I wrote: “The original Verve recording does sound positively prehistoric, with a scrawny and suspect rhythm section reminiscent of two street urchins rattling matchboxes at each other. If this was, as the drummer insists, his ‘master class’ in Brazilian rhythm playing, then he definitely needed a few extra lessons prior to graduation. At best, it’s rough hewn and multipurpose, but hardly the stuff of legend.” I did not mean that Buddy was the one giving the “master class,” but rather that he, Buddy, was sitting in on a “master class” being taught by native Brazilians – which was exactly what happened. As far as genuine religious conviction was concerned, though, Verdi limited his brand of Catholicism strictly to his music. An admitted agnostic, as well as a confirmed humanist on the home front, he had strong reservations about organized religion, having withstood a torrent of abuse from clerics and laypeople alike for his personal lifestyle, specifically his “living in sin” (an affair of the heart, no less) with former prima donna Giuseppina Strepponi, who late in the composer’s life became the second Mrs. Verdi. Indeed, there were many instances in the Italian master’s work – for example, in I Lombardi, Attila, La Forza del Destino, and the aforementioned Don Carlo, along with Otello and the Requiem Mass – where his grasp of religious ritual is clearly in line with accepted practice. Beyond that, Verdi gave religion and the church a wide berth; rather, he put his faith in opera as his principal means of expression – that is, how he felt about the human condition as it related to his characters. For that, he turned to his literary “gods,” Schiller, Hugo, and Shakespeare, for inspiration. At the opposite end of the spectrum, his compositional counterpart Wagner was as fanatical about religion and politics as any erstwhile nineteenth-century revolutionary could be. One can easily make a case for his works as espousing the concept of salvation through love via the sacrifice of a so-called “good woman” (an extraordinarily sexist term, I know, but that’s how things were back in the day). Look no further than Senta in The Flying Dutchman, Elisabeth in Tannhäuser, Elsa in Lohengrin, and especially Brünnhilde in Die Walküre and Götterdämmerung for evidence in support of this theory, where the basic motivation for these characters is the redemption of the male protagonist by a self-sacrificing female of the species. In as much as Wagner probably saw himself as the person most needing redemption, he likely cast his “role models” from life (i.e., Minna Planer, Mathilde Wesendonck, Cosima Liszt, among others) as his opposite number. What a modern-day shrink wouldn’t give to have analyzed this Leipzig-born maestro’s mind-set! Still, Wagner managed to stay ahead of the game with his next project. 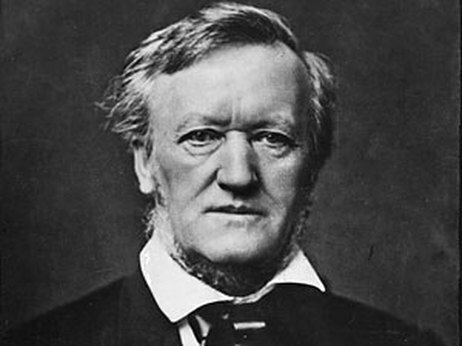 Having devoured the treatises of Nietzsche and Schopenhauer, along with the philosophical teachings of Buddhism and Hinduism, medieval poetry and epistemology, as well as early Christian doctrine, Wagner was ready to tackle what would become his most complex form of self-expression: the three-act “stage consecrating festival play” Parsifal (he refused to denigrate the work by calling it a mere “opera”). Overlooking this verbal sleight-of-hand for the moment, Parsifal, which premiered at Bayreuth in 1882, belongs to the same category of music drama as Debussy’s Pelléas et Mélisande, Berg’s Wozzeck, and Schoenberg’s Moses und Aron – in other words, a work that defies description, belonging to no specific time or place. Musically, there is nothing like it in the repertoire, nor is there much resemblance to Wagner’s previous output either, although hints of it are present in Tristan und Isolde and Götterdämmerung, as well as Parsifal’s predecessor, Lohengrin (Parsifal is Lohengrin’s father, after all) and its tremulous prelude. The score is comprised of lengthy stretches of chromatic passages, sophisticated harmonics and melodic translucency, with the various choruses (mostly male and boys’ choirs in Acts I and III, followed by the women’s chorus in the central section of Act II) divided into specific groupings in the intricate manner of a Bach chorale. There are also long, stately sections of expository singing (Gurnemanz, Amfortas) and, in Scene ii of both the first and third acts, reverberating bells that sound eerily like those of London’s Big Ben – so marvelously atmospheric! To say that listening to Parsifal is a transcendent experience oversimplifies the situation, and insults the intelligence of the creative mind that composed it. There are many irreconcilable issues related to the finished product, however, one of them being the realization that such an overwhelmingly moving work could have been written by so contemptible an individual as Wagner. In this, we must separate the man from his music, with Parsifal becoming the German master’s final word on the subject of salvation, this time by means of a pure fool (the title character) made wise through compassion (“Durch Mitleid wissend, der reine Tor”) – that is, compassion for another individual (Amfortas). Another problem is the allegedly spiritual nature of the piece. Not to knock Wagner the dramatist when he’s down, but unlike Verdi he did go slightly overboard on the religious inferences, not only in his depiction of the Grail from the Last Supper and the Spear that pierced the crucified Christ’s side, but in his Act I reenactment of the rite of Holy Communion. Mind you, none of this should be taken at all literally, it’s just theater. However, there are many audience members out there who feel a certain “compulsion,” if that’s the right term, not to applaud after Act I. For that, and for a host of other reasons, the opera was initially restricted to the margins of Bayreuth (as per Wagner’s wishes); but through some questionable maneuvering and self-serving machinations, described in detail in the March issue of Opera News, the Metropolitan, in 1903, became the first theater outside Germany to stage the groundbreaking work. Holding true to its tradition of presenting Parsifal in the best possible light, the Met recently unveiled a new production by French director François Girard, with sets by Michael Levine, costumes by Thibault Vancraenenbroeck, lighting by David Flinn, and the all-important choreography by Carolyn Choa. How the French love their Wagner! 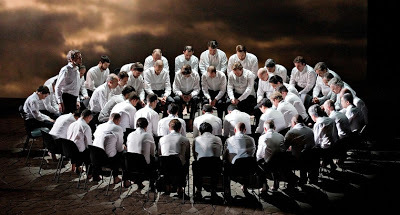 They always try to do right by him, as witness Patrice Chéreau’s 1976 centennial Ring cycle at the Bayreuth Festival, or the Met’s own 45-ton Ring production, directed by French-Canadian Robert Lepage and Company. The concept, heavy on symbolism and in modern dress, mixes concerns for the wounded environment – essentially, a gigantic representation of Amfortas’ open sore – with the coming together of the Grail Knights and the dispossessed female members of the community, previously divided by physical and/or psychological barriers, with a river of water and blood serving as the dividing line. It was greeted with critical kudos for the thought behind the process, as well as the brilliance of its execution. On the occasion of the radio broadcast of March 2, listeners were privileged to hear a truly first-rate performance of this challenging piece. 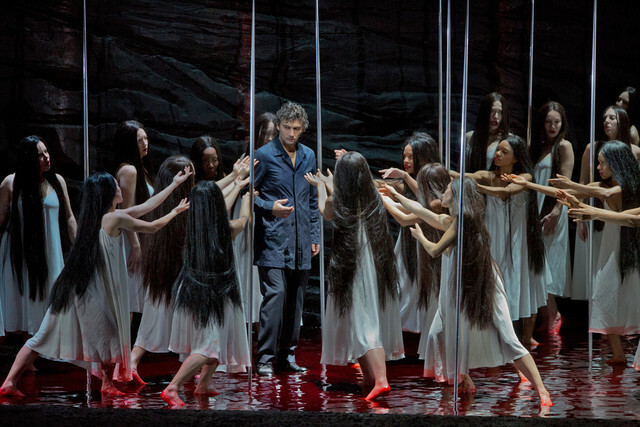 The well-schooled cast was headed by charismatic tenor Jonas Kaufmann as Parsifal, bass-baritone René Pape as Gurnemanz, soprano Katarina Dalayman as Kundry, baritone Peter Mattei as Amfortas, bass Evgeny Nikitin as Klingsor, and bass Rúni Brattaberg as the offstage voice of Titurel. Conducted from memory by Italian maestro Daniele Gatti, this Wagnerian dream team fulfilled all our expectations – and then some. From the first note to the last, it was obvious that Signor Gatti had thoroughly studied and dissected this massive score (he had previously conducted it, at Bayreuth, in 2009). Though not as leisurely paced as James Levine’s somewhat weighty approach to it, Gatti nonetheless led a superb Met Opera Orchestra, one of the world’s finest ensembles, in a sublime reading that can be favorably compared with those of such past Parsifal proponents as Arturo Toscanini, Erich Kleiber and Pierre Boulez. For the most part, tempos were unhurried but never prosaic, lyrically judged yet sinisterly shaded when needed to be; nor did they lack for drama. In addition, the opening of Act II – the more “action oriented” of the three – quickened the pulse, as Gatti spurred the orchestra on to a most satisfying conclusion, in the best conducted broadcast of the season. Bravo, maestro! Much like Russian diva Anna Netrebko, the darkly attractive Jonas Kaufmann is the Met’s hottest box-office draw at the moment. At this point in his career, Kaufmann can do no wrong. It’s not every day that a singer of his qualities, who can manage the stylistic anomalies of Florestan in Fidelio, Faust in Gounod’s opera, and Siegmund in Die Walküre, is equally at home performing Massenet’s Werther, Cavaradossi in Puccini’s Tosca, and Don José in Bizet’s Carmen. This certainly smacks of a new Golden Age at the Met – and elsewhere, for that matter. Sounding incredibly like Jon Vickers, but without that tenor’s annoying mannerisms, the baritonal aspects of Kaufmann’s voice were brought out, in particular during the Act II seduction scene, where the searing intensity of his cry, “Amfortas! Die Wunde!” was keenly felt. 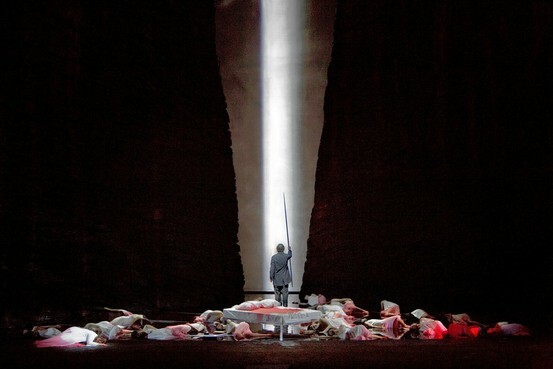 After Kundry’s passionate kiss, Parsifal comes to understand the full measure of Amfortas’ pain and suffering. No longer the pure fool, the tenor’s interpolation of this scene became pure heaven. By Act III, his Parsifal had achieved his humanity, enough to relieve Amfortas of his burdens. This Kaufmann expressed softly, gently, and with the greatest of care: “Enthüllet den Gral. Öffnet den Schrein!” (“Uncover the Grail. Open the shrine!”) A splendid performance! As Gurnemanz, René Pape was a hugely empathetic wall of solid bass sound. In the wrong hands, this role (one of Wagner’s longest) can quickly unravel and turn into a crashing bore. Not so with Pape. His major contribution was imbuing the old retainer with an enormous amount of understanding, his gorgeously rounded tones filling the Met auditorium easily and abundantly (I can’t wait to hear his Wotan). He was greeted with a rousing ovation, as were all the cast members. Katarina Dalayman, as the principal female lead among so many males, stood out primarily for her acting ability. All throughout the outer acts, Kundry hardly speaks in full sentences; her phrases are choppy and dished out in short spurts. But in Act II, Dalayman finally came into her own by going at full tilt, including an ear-splitting two-octave leap at the line, “Lachte!” The best sung and best enunciated performance of the day, however, was Peter Mattei’s tortured Amfortas. Beautifully acted despite his infirmities, this Amfortas gleamed brightly, even at his most perturbed. As the evil Klingsor, Russian basso Evgeny Nikitin spat his words out with equal dollops of venom and bile. His magician was evil incarnate, bathed in the river’s blood and bald as a newborn babe. His was a fascinating portrayal of this self-mutilated lost soul; one almost hated to see him vanquished. I’ve saved the best for last. The Met Chorus outdid itself in one of its most impeccable showings. The chorus members were magnificent in their many guises as knights, pages, esquires, Flower Maidens (each of them bearing a spear and with straight jet-black hair over their eyes), boys’ choir, you name it. The highpoint was their final plea to Amfortas, imploring him to uncover the Grail for the last time (“Zum letzen Mal!”). They, too, were warmly greeted at the end. So, to wrap things up, Verdi’s Don Carlo was conducted in sluggish fashion, while Wagner’s Parsifal was given a lighter than usual touch. This was a momentous week for the Catholic Church. With the election of a new pope, Holy Week, Catholicism’s most solemn event, will soon get underway with Francis I, the first-ever pontiff from Latin America, leading millions of celebrants to worship. Coincidentally, New York’s Metropolitan Opera is also celebrating a momentous event – or should I say two events. These are the 200th anniversary of the births of two pillars of the operatic repertoire: composers Richard Wagner and Giuseppe Verdi, one a German and the other an Italian. And to bring the connection to opera and religion even closer, through the years we’ve been treated to a manifold variety of popes: Italian ones, a Polish one, a German one, and now a pope from Argentina – one whose alleged involvement in his country’s complicated politics has been brought into question. In the past, the religious realm has often encroached upon the political arena, with one side or the other coming out ahead (at least, temporarily). If the last several weeks are any indication, the two spheres will continue to clash over which will ultimately prevail. In that respect, both Verdi and Wagner were supremely talented and experienced men of the theater, with Verdi being the least religious of the two, and Wagner the most nominally sanctimonious. Nevertheless, they had a profound awareness and innate understanding of the conflicts that arise when dealing with church and state. These conflicts were to explode in Verdi’s masterful treatment of German playwright Friedrich Schiller’s five-act Don Carlos. The opera premiered in Paris (in the French language) in 1867, although the Met presented one of the master’s longest works in Italian (Verdi having reworked and re-fashioned it numerous times to suit the homegrown crowd), hence the title designation without the “s.” The story of Don Carlo takes place during the Spanish Inquisition, at a time of religious persecution, intolerance and social upheaval involving Belgian Protestants and the usurping Spanish Catholics, with Spanish King Philip II at its center. Verdi loved the inner struggles of public duty versus private anguish, and developed characters and situations tailor-made to fit the occasion. The broadcast of March 9, featuring an all-star Met lineup in this revival, brought these forces to the fore. Nicholas Hytner’s 2010 production, with sets and costumes (mostly black, red and gray) by Bob Crowley and lighting designs by Mark Henderson, resembles a giant Lego set, but the lavishness of the proceedings far outweighed the more mundane moments. And there were plenty of them, to say the least, with veteran baton twirler, 82-year-old Lorin Maazel, at the orchestra’s helm. This must have been the slowest Don Carlo on record, beating out even Herbert von Karajan’s ponderous version for Salzburg by many lengths. I sensed discord coming from the ranks, and there was a noticeable lack of coordination between stage and pit, with Donald Palumbo’s Met Chorus losing out on all counts. Surely, this is a long enough work as it is, but Maazel’s elephantine tempos dragged it into an even more excruciatingly slow-going affair, especially in the auto-da-fé sequence where the Belgian delegation is arrested and religious heretics are burned at the stake (a festa, or “festival,” as King Philip pronounces in Act III). I’ve never heard such bland conducting, and coming from maestro Maazel, once touted as a musical prodigy in his youth, it was doubly unacceptable. Sensing this, he did not come out for his curtain call, and eschewed appearing with the cast for fear of being booed on the airwaves – something I’ve yet to encounter in my over 45 years of radio listening. Good riddance to bad rubbish, I say! If Maazel was a stopgap measure for the absent music director James Levine, who truly loved this masterwork, then the less we see and hear of him the better. 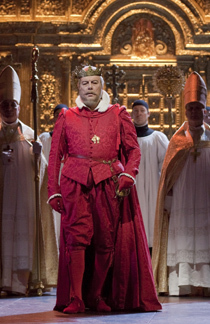 The saving grace of this broadcast was the marvelously acted and sung Philip II of Italian basso Ferruccio Furlanetto, whose cavernous voice and regal bearing enveloped the character as only the best performers can. With fond memories of Cesare Siepi, Giorgio Tozzi and Ruggero Raimondi still ringing in my ears, Furlanetto mopped the floor of the competition as one of the finest interpreters we have today of the bigoted despot. 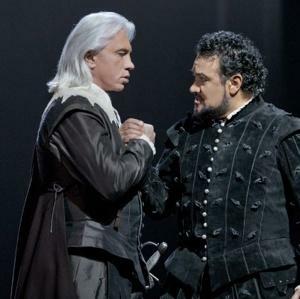 His long Act II duet with the fervently portrayed Rodrigo of Russian baritone Dmitri Hvorostovsky, heard earlier this season in the Met broadcast of Verdi’s Un Ballo in Maschera, was a major highpoint. 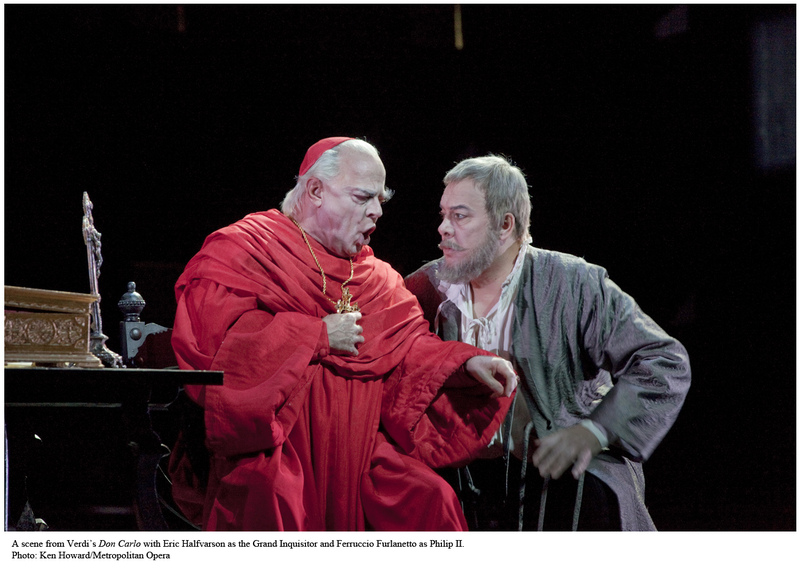 Furlanetto’s parting warning to Rodrigo to beware of the Grand Inquisitor’s reach (“Ti guarda!”) sent chills down one’s spine. He also excelled in the king’s inward looking monolgue, “Ella giammai m’amo” (“She never loved me”), in Act IV, in which the dour monarch contemplates the possibility his young bride Elisabetta (in a marriage of political convenience) is having an affair with his son, the titular Don Carlo. It’s a most shattering and revealing moment as Furlanetto, his agony heartfelt and open, let out all the stops, earning a huge ovation for his efforts. This was topped by the subsequent episode with the pitiless Grand Inquisitor of Illinois-born Eric Halfvarson, who held his own as an implacable force to be reckoned with. Their battle of wills represents the central conflict in the drama, i.e., whether the demands of the church, in the Grand Inquisitor’s request to hand over the king’s confidant, Rodrigo, for “safekeeping,” take precedent over the affairs of the state (or the heart). Vocally, this was a lower-voiced singer’s field day, with the rousing Hvorostovsky’s thoroughly outgoing performance and mezzo-soprano (and fellow Russian) Anna Smirnova’s “jealousy incarnate” Princess Eboli igniting the stage. Smirnova earned the lion’s share of bravos for her forceful singing and dynamic acting ability, however unfocused her top notes may have been. The Elisabetta of Italian soprano Barbara Frittoli, who along with the unflappable Furlanetto shared an agreeable command of the language, did not have the right timbre or vocal nuance for this role. Granted it’s not one of Verdi’s most rewarding female parts, but it does require a great deal of stamina and raw emotion in her duets with the kinetic Don Carlo and her confrontation with the angry king over her supposed affair. The character’s last act scena, “Tu che le vanità,” is one of the most challenging in the repertory, coming as it does near the end of a very long evening indeed. Frittoli managed it well enough, but her fluttery tones felt divorced from the reality of this most down-to-earth of Verdi’s later heroines. This brings me to Mexican tenor Ramon Vargas’ Don Carlo. Blessed with an attractive voice and clear-as-a-bell diction, his assumption of this vocally heavier part, while attuned to the character’s noble suffering, strained his basically lyric instrument in the extreme. I found it much too high for Vargas to negotiate successfully, with evidence of forcing at too many key intervals (his duet with Rodrigo, his second duet with Elisabetta, and his outburst during the auto-da-fé scene); dramatically, it went beyond his limited resources in that department as well. I did not fault the tenor outright, though, but rather the composer and his librettists for not providing Don Carlo with enough opportunities to make the case dramatically, while providing too many opportunities to be outshone by the other protagonists. Let the tenor beware: whoever takes on this daunting role, now or in the future, will face a most thankless assignment. In this production, the last-act deus ex machina appearance of Philip’s father and Carlo’s grandfather, the Holy Roman Emperor Charles V (the wavery toned Miklós Sebestyén), leaves it up to the listener as to who the real winner of this confrontation might be. In history, Charles V abdicated his throne to lead a sheltered and prayer-filled life at the Monastery of St. Just in Spain. Similarly, our present-day Pope Benedict XVI (now Pope Emeritus) stepped down from his role as Head of the Church in order to devote full-time to thoughtful contemplation. The contrast between the stage and real life, then, is too compelling to be dismissed. We’re at the halfway mark, folks. Intermission time, as they say in the theater. 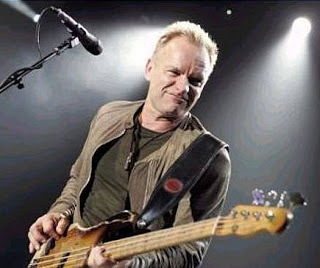 And Sting dutifully obliges by providing an appropriate musical passage – the equivalent of our seventh-inning stretch – in “Saint Agnes and the Burning Train.” He (on bass) and Dominic Miller (on acoustic guitar) take turns serenading the listener with this ethereal, classically-based interlude, a soothing if slightly melancholy diversion from the “godless sea,” “mountains of endless falling” and doom-laden “dark angels” of the previous number. As part of the CD’s packaging, the accompanying booklet includes a color reproduction of a black-sail ship against a pale yellow sky amid the maritime expanse, as described above. In fact, all of the paintings (credited to artist Stephen Campbell) serve to contextualize the songwriter’s lyrics in a way that never detracts from, but instead enhances, our enjoyment of them. There’s no going back. “You’re lost on the wild wild sea” is repeated, over and over, the drum-pounding taking over the rhythm, the electric guitars pulling the theme along in the manner of the lyrical ropes mentioned above. Just then, as the music begins to die away with the verse, the Northumbrian pipes are heard in the distance – reminding us that all is not lost, that life goes on as before. Well, maybe not as before, but it will go on. 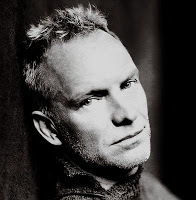 One day our loved ones will join us in death, Sting is saying, his voice spare, lean and stark against the rising tide. What possessed the man to do this? Why not end this tribute to dear old dad on a more upbeat note? There was a time when I couldn’t bear to listen to this number. I used to program my compact disc player to bypass mode, looping it back to the opening “Island of Souls” instead of plowing through this depressing piece. In recent years, however, I’ve opened myself up to its hidden treasures. Lord, this is a gorgeous setting of a masterfully composed song! It’s taken me “all this time” (tongue planted firmly in my cheek) to appreciate the myriad sonorities and psycho-acoustic properties inherent in it. The image of the redeemer (“These are my feet / these are my hands”), which is indicative of Christ’s showing of his wounds to a skeptical flock of Doubting Thomases, clashes with our contemporary notions of an all-loving, all-forgiving godhead. What he demands of his people, then, is more problematic. It’s not the demons he wishes us to cast out, Sting tells us, but the fallen angels, knowing full well that Lucifer (Satan’s former self) was once the Prince of Angels, before he was cast down to earth for fomenting rebellion (“Better to reign in Hell, than serve in Heaven,” per Milton’s Paradise Lost), in another of Sting’s many literary allusions. Droning on ad nauseam for several minutes, this brilliantly executed coda, in addition to Miller’s quasi-cavaquinho-like guitar mode (very Brazilian sounding, I might add, and book-ending “Island of Souls” quite nicely) and Manu’s lightly tapped rim shots, ends softly – just as The Soul Cages began – with the simplest of sign-offs, i.e., Sting tossing off a casual “Good night” to his audience. I’ve held back many of my comments to keep this analysis down to human proportions. I could go on and on, though, extolling the virtues of Sting’s most personal recorded statement. But I’d rather leave it to readers to come to their own conclusions about The Soul Cages. I’ll be going back to it soon, I assure you. It’s that good. ‘Sadness Has No End’ – Part Six: It’s All About the Music, Isn’t It? With his stirring defense of Cacá Diegues’ Orfeu resonating in the international press, Caetano Veloso inadvertently hit upon the chief catalyst for the film’s poor showing with English-speaking audiences,* but through a side argument: and that is, the music. Or rather, the lack of an identifiable musical theme or idea as a viable reference point for viewers. What it all boils down to, quite simply, is this: where Marcel Camus’ 1959 version had no trouble ingratiating itself to the musical mainstream of its day — namely, the jazz-pop idiom, thanks largely to the pioneering efforts of Jobim, Moraes, Bonfá, and the rest of the Brazilian bossa-nova crowd — the Alagoan director’s elaborate excursion into socially relevant cinema benefited from no such windfall. A sampling of the later film’s soundtrack bears this out. Charged with providing a musical backdrop for Cacá’s contemporaneous view of Orfeu (shades of the young Antonio Carlos Jobim, hard at work preparing Vinicius’ play in verse for the Rio stage), Caetano decided to spice the new movie up not just with old favorites from The Little Poet’s pen (“all of them works of art”), but with some out-of-the-way innovations of his own. The results, “História do Carnaval Carioca” (“The History of Rio Carnival”) and its companion piece, “O enredo de Orfeu,” loosely translated as “The Script of Orpheus’ Life” and co-written with Brazilian rapper Gabriel o Pensador (“Gabriel the Thinker”), are in the form of rougher-edged samba-funk; while “Sou você” (“I am You”), a soft-grained but anachronistic voice-and-guitar track, is an unabashed throwback to the romantic film ballads of yore. In addition, there were several outstanding holdovers from the French-directed Black Orpheus, which consisted of revised versions (more like old wine in new cachaça bottles) of the classics “Manhã de Carnaval” and “A Felicidade,” tossed in with “Se todos fossem iguais a você” and “Eu e o meu amor,” two free-flowing show tunes from the original play that never made it to the screen, before now. 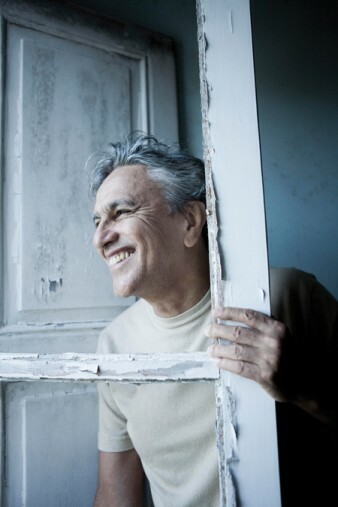 On one level, Caetano’s newly minted “insertions” mirrored his abiding faith in, and deep admiration for, Brazilian street samba and its roots in Afro-Brazilian culture as well as the hip-hop vibes emanating from the once frowned-upon favelas — musically speaking, the poor side of town. On another, more cultivated plane, he felt an obligation to reach across class lines and extend a warm hand to bossa nova, its close cousin, which had its origins in the less economically-deprived areas of Ipanema — on the opposite side of the social track — and for which he expressed a longstanding desire to welcome back into the fold. Ever mindful of the esteem Camus’ work was still held in most foreign quarters, the singer-songwriter’s plan for incorporating this multiplicity of styles into the revamped Orfeu might actually have undermined his own efforts toward that end. What he got instead was a constant clash of musical and cultural ideas, inappropriately linked, in this author’s mind, to the onscreen battles being waged by evil drug dealers and corrupt police officials, with innocent by-standers (us viewers, perchance?) caught in the middle. Sonically, too, there was so much going on one found it trying at times to focus on any one aspect, with the violence and music pumped out at full volume while playing first and second fiddle to the casual love interest between Eurídice and her main man, Orfeu — a mere afterthought in the script and fueled by a noticeable lack of chemistry between the two leads. Moreover, equating gangsta rap, funk, and hip-hop with some of the more, how shall we put it, lurid story elements (“an ode to the energy, the love and creativity that survive in the midst of violence and misery,” in Diegues’ worldview) was a major faux pas on Veloso’s part. “And if middle class people of today associate poverty with crime,” to repeat the film director’s earlier views, “imagine in the fifties.” Imagine indeed. In regard to his chameleon-like score, perhaps the sobering thoughts of film scholar Robert Stam can enlighten us as to Caetano’s reasoning behind it all: “[I]t was Black Orpheus, more than any other film, that introduced samba and bossa nova to the world [and whose success] opened the doors for the newborn bossa nova, the ‘modern samba’ that the film’s soundtrack juxtaposes with traditional samba,” born afresh, it would seem, in the Bahian composer’s bold, new experiment to capitalize on his audience’s past acquaintance with these forms, as opposed to its over-reliance on the present-day variety. Did his gamble payoff in the long run? Judging from the fair-to-middling sales of the movie’s soundtrack, coupled with the lukewarm reception the film itself received around the world-music front, one is forced to give this labor of love a mixed grade at best: certainly an A for effort and an A+ for execution, but only a low to middle C for trying to have it both ways and for incompatibility with the extraordinarily broad range of styles that Brazilian popular music has now grown to encompass. 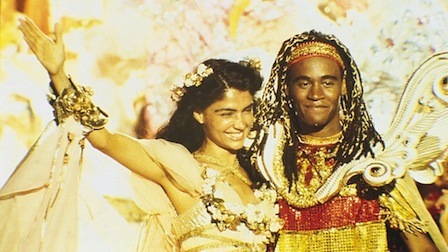 And certainly, too, for connoisseurs of the Academy Award-winning Black Orpheus and its forerunner, Orfeu da Conceição, this “with-it” adaptation of the ancient Greek myth was a low point in their affection for the smoother, gentler sounds that once sprang from the melody-rich nation of Brazil. (So she finally crossed over into the funk and hip-hop realm. What else was new?) If anything, it proved beyond a reasonable doubt that no matter how hard you try, you can’t go home again to Rio — even with Caetano Veloso as your guide. * By Diegues’ own entirely unscientific methods, Orfeu had earned excellent critical reviews in such cities as Seattle, Chicago, and Los Angeles. But it failed miserably in New York, of all places, the alleged Mecca for all things progressive and avant-garde. This may have led to its not even being nominated for Best Foreign Film at the Academy Awards ceremony the following year. What a long Saturday last February 23rd proved to be! The reason: back-to-back Metropolitan Opera productions of two of the company’s most popular presentations, the first of Bizet’s immortal Carmen, the regular Saturday afternoon radio feature; followed later that evening by a Live in HD re-transmission of Puccini’s Turandot from 2009, in the gargantuan Franco Zeffirelli setting. Oy vey, it’s enough to make one’s ears split and head spin. Let’s start with Carmen. Everybody and their mother seem to know this seminal work. Deemed a “failure” at its 1875 Paris premiere (not so, according to musicologists), it was Bizet’s last completed composition. In fact, the title character is considered one of opera’s quintessential female leads, a femme fatale who attracts not only spineless men-folk but also singers from all walks of operatic life, with some of Mother Russia’s best known artists among the more plentiful. Past interpretations by mezzos Irina Arkhipova, Elena Obraztsova, and Olga Borodina are indelibly etched in our minds. Even the younger crop of East European singers holds Carmen in esteem. 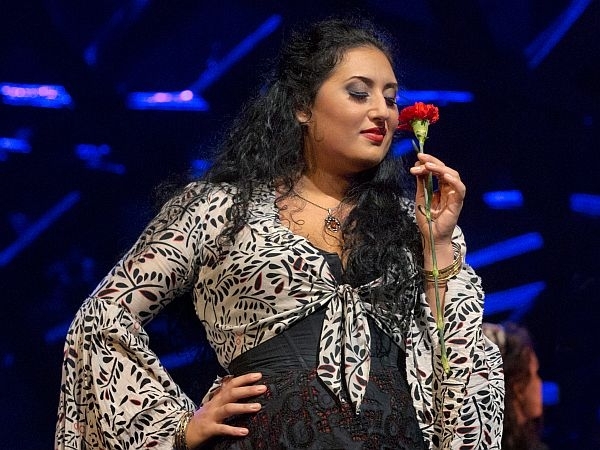 This includes the 28-year-old Georgian-born Anita Rachvelishvili (pronounced rotch-VELL-esh-VEEL-ee), who made her 2009 La Scala debut in the part, as well as her first Met appearance in Richard Eyre’s new production back in 2011. Set in so-called “modern” times, i.e., 1930s Fascist-era Spain, this version received a rousing reaction from both audiences and critics alike when it starred the sizzling combination of Elina Garanča as Carmen and Roberto Alagna as her lover Don José. 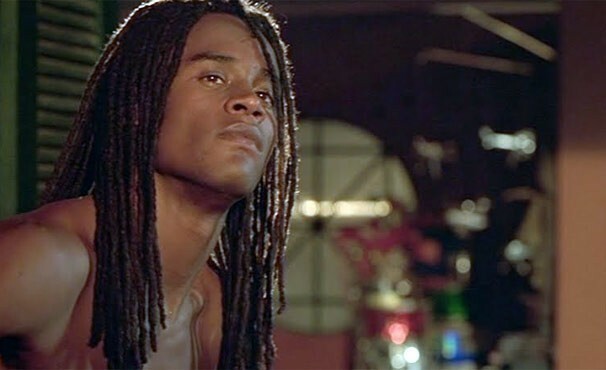 The current cast did its vocal best to duplicate the previous couple’s success, but with mixed results. The problem I have with this production is the Met’s decision to use musical material not written by Bizet, but rather a fellow named Ernest Guiraud (who did the same for Jacques Offenbach’s unfinished Tales of Hoffmann), in place of the original opéra-comique dialogue, which gives greater prominence to Don José and the other participants. With great singing-actors, this hurdle can usually be overcome; not so with lesser artists. Still, by not respecting Bizet’s original intentions, the Met, which previously used the dialogue-heavy edition in 1973, discarded almost 40 years of musical scholarship in favor of this bowdlerized version. So be it. In last Saturday’s broadcast, Rachvelishvili definitely stood out, the voice dusky and burnished, with that peculiarly vibrant Slavic “ring” so typical of the breed. This newer generation of singers, incidentally, has pretty much dominated the company’s roster for several seasons now. Nothing wrong with that, but the results aren’t always what one would hope for. This turned out to be the case with the otherwise talented Rachvelishvili. Already the signs of overuse abound, especially around the edges of her voice, the high notes coming out as unfocused and wishy-washy – that is, when she didn’t avoid them entirely – the low ones blowzy and unsupported. Performance-wise, it was hard to judge from the radio how she fit into the picture. However, I could tell that she threw herself into the part, which was a welcome change from earlier expectations. Each of Carmen’s numbers was individualized, and as the opera progressed – and the drama grew darker and more fatalistic – her final duet with the spent Don José (voiced by another newcomer, the Austrian tenor Nikolai Schukoff) drew plenty of sparks from the stage. She ended up in a better position than when she started, which is a good indication of how far this singer can go. My advice would be for Rachvelishvili to study the coloratura mezzo roles of Rossini and Donizetti, which have done wonders for Garanča, Cecilia Bartoli, Joyce DiDonato and their ilk, as well as preserving the natural range and elasticity of their voices. Speaking of Schukoff, this debutant’s soft singing outshone his more robust outpourings, most prominently in his exquisite delivery of the Act II Flower Song, “La fleur que tu m’avais jetée.” When Roberto Alagna reached this same point a few years ago, he too preferred the less showier, less rafter-raising ending – indicated in the score, by the way – at the words “Et j’étais une chose à toi / Carmen, je t’aime” (“And I was but a plaything to you / Carmen, I love you”). Tenor Schukoff took an even more discreet approach, floating his high note so sedately it barely registered on the meter. Earlier in the aria, his superbly controlled diminuendo on the phrase “De cette odeur je m’enivrais,” was a thing of rare beauty. I was surprised at the smattering of applause that greeted his efforts. Lamentably, Alagna had received a similar mild response from Met audiences. I guess the public, weaned on past performances of more dramatic types – Del Monaco, Corelli, Tucker, Vickers, and Domingo among the better ones – finds it awkward to reward their male protagonists who espouse a subtler view of things. It wasn’t the first time this incident has occurred, to the unfortunate detriment of the performance as a whole; but I’m sure Schukoff will move on to meatier parts. Moving on to the other cast members, soprano Ekaterina Scherbachenko (from Moscow) gave a finely etched portrayal of Micaela, the country bumpkin role given short shrift by some, but here rendered with potency by this lyrically adept singer. But the real rabble-rouser of this show – that of the flashy bullfighter Escamillo – was assumed by fellow Russian Ildar Abdrazakov. His wide-ranging bass, while perfect for Verdi and Mussorgsky, was all over the musical map in this part, in particular his overly familiar Toreador Song. He must’ve cut a virile figure on the stage, however, what with his movie-star looks and muscular build – perhaps a little too muscular for a bullfighter – but he served the purpose nicely. Baritone Trevor Scheunemann showed promise as Morales, while bass Richard Bernstein was a flavorful if underpowered Zuniga. The four gypsies, Daniella Pastin (Frasquita), Jennifer Johnson Cano (Mercedes), Marco Nistico (Dancairo), and Scott Scully (Remendado), were all decent in their respective roles. Conductor Michele Mariotti, who drew such miraculous playing from the Met Opera Orchestra from the previous Saturday’s Rigoletto, here toned things down a might. Unlike the energetic Yannick Nézet-Séguin, who plunged headlong into the prelude with such verve and gusto, maestro Mariotti took a more leisurely tack, but without diluting the essence out of the opera’s most sparkling sequences. Puccini’s last opera Turandot is a most curious piece. It’s the most challenging of his stage works, requiring singers of the highest abilities as well as a huge orchestra and chorus. Included in the old RCA Victor recording with Nilsson, Bjoerling, Tebaldi and Tozzi, conducted by Erich Leinsdorf, was a learned essay entitled “The Riddle of ‘Turandot’,” which discussed not only the three riddles posed by the icy Princess Turandot to the love-struck Prince Calaf, but the unsolved riddle of what the opera might have sounded like had Puccini not died before finishing his score. Commissioned by La Scala and supervised by the work’s conductor, the famed Arturo Toscanini, one Franco Alfano completed the opera from the middle of Act III to the end. Mysteriously, there are no commercial recordings of Alfano’s ending, although I did hear his version at New York City Opera in the late 70s and early 80s. It’s a fuller, more logical conclusion to one of the last in a long line of grand operas, with music of an exotic, other-worldly nature quite in keeping with the story line, but so unlike Puccini’s writing. Unfortunately, it’s never been given a chance. Toscanini hated it, and promptly went about cutting and pasting, as well as rearranging, the last scene for the 1926 world premiere. What we hear today on most of the world’s stages, then, is Toscanini’s re-edited and re-composed amalgamation, which is not entirely in Alfano’s hand. With that business out of the way, let’s talk about the performance. This 2009 revival of Turandot starred Russian diva Maria Guleghina in the title role, workhorse tenor Marcello Giordani as Calaf, another Russian singer, soprano Marina Poplavskaya, as the slave girl Liu, and veteran basso Samuel Ramey as Calaf’s father, Timur. The opera was conducted by Andris Nelsons. None of these artists was outstanding; in fact, they all sang about as well as anyone could, given the conditions they were performing in. Those conditions included the preposterous faux chinoiserie that took the place of actual story-telling. Zeffirelli’s overpowering Met production originally featured Eva Marton, Placido Domingo, Leona Mitchell and Paul Plishka in the principal roles, with James Levine presiding. Not that these artists were any more outstanding than the current group above, but at least they brought needed star power to the proceedings. All were dwarfed by the lumpy staging, the haphazard nature of the sets, and the lack of a reliable playing area for the singers to perform in (a problem endemic to the Met’s recent Ring cycle as well). What direction there was simply did not fit the mise-en-scène. And the absence of a cohesive design or viable choreography basically left the singers and chorus to their own devices. The Met is long overdue for a more functional production. How about it, Mr. Gelb? As for the singing, Madame Guleghina has a big, burly voice of tremendous proportions. She also has stunning good looks and a fine stage presence. That’s the good news. What she doesn’t have are high notes to go with the role. Oh, she acted it well enough, but Guleghina ran out of gas toward the middle of the Riddle Scene, where she basically scooped up to whatever notes she had left in a most unappealing manner. She ended up only approximating the role’s high notes but never quite attaining them, a major disappointment. In 2009, Ms. Poplavskaya was still developing an artistic personality. Since then, she’s been working on her own individual identity and profile (much as Anna Netrebko has done in recent years), so it’s unfair for me to judge her by this filmed performance. As a whole, she made a pleasant sound, but neglected to play up the inherent sympathetic qualities that Liu can afford a more experienced artist. Conversely, Mr. Ramey has seen far too many productions to be anything less than professional in his limited capacity as Timur. But after almost 35 years on the stage, his middle voice has turned wobbly and, to be honest, unpredictable. His top notes are still potent, but the rest of the voice is in parlous condition. He makes a mighty noise, however, and he’s gotten bigger with age. He’d make a formidable Grand Inquisitor in Don Carlo. Indeed, the best singing of the day came from 80-year-old character tenor Charles Anthony as the aged Emperor Altoum. Still commanding the stage after nearly 3,000 performances in 67 roles at the Met, the matchless Mr. Anthony blew away the competition with his stentorian voice, a true miracle man. As you might expect, I’ve saved the worse for last. Poor Marcello Giordani! No one works as hard at a role as he does. If only he stayed on pitch. His singing has always been a bit raw for my taste, but unobjectionable. Lately, however, he’s forever singing sharp, and it annoys the heck out of me. He’s ruined so many good performances of standard and non-standard works that I’ve grown to accept this defect – which is bad for me, and bad for his fellow performers. Everything above the staff is grating. Besides his lack of an inviting tone, Giordani continues to play the same forlorn character, and in the same forlorn fashion, in every single piece he’s in. Whether it’s Calaf, Pinkerton, Faust, Ernani, Benvenuto Cellini, Edgardo, and Des Grieux – you name it, there’s no differentiating one part from another. He manages to hit the high notes all right, but the sound he makes in getting there is a most unpleasant one. I’m sorry, folks, but is it me, or have others heard what I’ve heard? That may explain why record companies failed to sign Giordani to any long-term commitments. Look in the catalog or on Amazon.com: you won’t find a single complete opera album with his name on it. 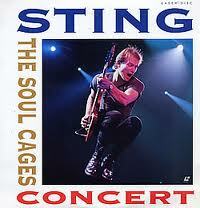 There are plenty of DVD’s and Blu-rays of live performances, though; even a compact disc or two. Beyond that, he’s nowhere to be found – and that’s evidence enough of what I’ve been saying. Here’s my last gripe about this performance of Turandot: the opera is still not being played note complete. Surely, other operas have benefited from completeness (i.e., Rigoletto, Lucia di Lammermoor, Die Frau ohne Schatten, all of Wagner’s works), but the Met still cuts the wonderful Ping, Pang and Pong trio, from Act II, Scene i, to shreds. It’s my opinion, and the opinion of music scholars far more knowledgeable than I, that this scene contains Puccini’s finest vocal writing. Please, the next time Turandot is given at the Met, do the right thing and give us more of its music! In addition, do give your audiences a chance to hear Alfano’s original ending. It’s not as bad as Toscanini thought it was, and quite worth the cost and effort to let others come to their own conclusions. Thus, the riddle of Turandot will be answered once and for all: but for Puccini’s untimely death, this is how his last opera would have sounded – even if he didn’t write the music.